Dedicated to the great people in the marvellous community of classified advertising. 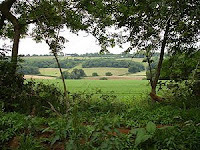 Surrey has some natural air conditioning too, as this picture from wikipedia shows. Today's post appeared one week ago in The Redland Times, Cleveland, Redland City, Queensland, Australia. A REFERENCE somewhere in the history books may note the beads of sweat on Captain Arthur Phillip’s brow as, in the middle of a southern summer, he presided over the raising of the Union Jack to claim, in effect, the island continent for Mother England. Imagine the whispers among the assembled soldiers and convicts, suffering the colonial heat. "Here he goes again -- wouldn’t you think he’d cut the waffle and let us get out of the sun?" The Sydney Cove ceremony on January 26, 1788, started some sticky centuries for "cold-blooded" English folk but it must be acknowledged that many revel in our warm to hot summers. SURREY-born Wayne Fullard’s introduction to Australia followed that of Phillip’s First Fleet by 211 years. That was in 1999, and a further 10 years on, Wayne gets a bit sentimental as he says: "I just fell in love with the place." Wayne, an air-conditioning engineer who specialised in retail centres and shops in the London region, has never feared a hot day. He had several stints "down under" before another love bug bit in a Cleveland restaurant in 2003, when he met the Brisbane-born woman he would marry in 2006. Ella Fullard has devoted her administrative skills to helping Wayne build his business from a home base at Alexandra Hills. THEY had a busy 2008, with major projects including a new Endeavour Foundation centre at Toowoomba, as well as many smaller commercial and domestic contracts. The couple had a hectic festive season. Their marriage created a combined family with five grown-up children and a growing band of grandchildren, now numbering four. Of course, the stream of visitors from the UK has been steady. The Fullards farewelled the last of the current bunch on Wednesday when their friends, Eric and Wendy Holmes, boarded a plane back to London. Another friend is due next month, then Wayne’s son, Lee, and his girlfriend Kate, will arrive in April. THE UK visitors come here with confidence in Wayne’s ability to cool down a hot day; back home, they can call on Wayne’s elder son, Dean, who now runs the Surrey business. There have been no First Fleet-style grumbles from the Londoners whom the Fullards host. "They all love the Redlands area – they think it’s beautiful," Ella says. On the development of the business, Ella and Wayne thank Brian Forsyth, Santo Coco, Neville Wright Barbara and Tony Wills, and "our wonderful children", Sam, Leah and Zena, all of whom have contributed along the way. Thanks for joining me to meet the great people in the marvellous community of classified advertising. Wayne and Ella Fullard advertise in the Trade Services section of The Redland Times Classifieds. Images - The Rumney brothers at Mowbray Racecourse, circa 1960. 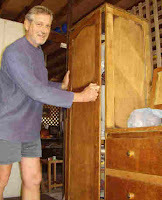 They are, from right, Percy, my dad Gil, Reg and Jack; and that’s me with an old wood robe (just in case you are as easily confused as me, this link from the archives keeps the current post at the top of the page, so scroll down for more on the silky oak wardrobe). MY old uncle Percy had a quaint term to legitimise his fascination with thoroughbred horses. He spoke of each donation to the bookmakers as an "investment", rather than a "bet". This sad tale has a modern sequel after the nation’s superannuation savings – from two decades of garnishment of wages – have taken a battering in the stock market, which is "investment" to some and a "gamble" to others. I wish Percy and maybe some modernday superannuation managers had talked to Bob Metcalfe, who represents what he says is one of the safest investments. BOB, his wife, Dianne, and her dad, Merv Alley, worked feverishly for most of the last half of 2008 to set up a shop in Bloomfield Street, Cleveland. But Bob and Dianne are not selling financial packages or dispensing money-management advice. Their business is Bayside Antique & Collectables Centre, which occupies a former service station. "Good antiques and collectables will never go down in value," Bob says. "They only go up -- something like 11 per cent (return) a year for a good quality item, such as a Victorian gold chain or an 1880s Australian-made cedar chest of drawers." The Australian Government in fact has sanctioned investment in antiques, collectables and fine art for superannuation purposes, subject to its conditions, Bob says. THE couple searched hard for the right Redland premises. The trio toiled for about two months on major renovations of the old garage before they picked up a paintbrush. The premises now provides about 650 square metres for about 20 independent dealers. Bob says customers will always find a wide range of items. Antique cameras, retro and vintage clothing, jewellery and furniture for different tastes are among features. The shop opened as the financial crisis bit, but Bob says the gloom has not affected business: "We are doing better than we thought we would." Which seems to indicate the strength of the "antique economy". IN the nature of the write-offs on financial articles, I must ask readers to seek independent advice before buying anything for investment. But even browsing collectables and antiques is enjoyable. And who knows? You may spot something that has been undervalued. Bob says a Brisbane man several years ago bought for a few dollars what a dealer believed was a Albert Namatjira print – the painting was valued at $30,000. THANKS for joining me to meet the great people in the marvellous community of classified advertising. This column has appeared in The Redland Times. FOOTNOTE: It is a special pleasure for me today to publish a picture of the man who, with my mum, Jean, introduced me to the marvellous community of classified advertising when, all those years ago in the summer of 1955, they placed a notice announcing the birth of a son. Those who are disrespectful of classified advertising may note this significant cultural relationship and that a big chunk of the population has had a similar start in life. The proud tradition continues (Classie Corner archives). For an example of such disrespect, read what Geoff Brooklyn of Sydney had to say on the News blog. I can only wonder why Geoff would bother and I must suggest he stops and thinks before putting out his claws. Don't seek, my friend, we cannot say what end's in store for you, for me: don't trust in vague astrology. Better to shoulder what will be, whether you soon will die, or stay to watch the shore exhaust the sea. So drink some wine while your hours flee, put small trust in posterity, and prune your hopes; but pluck the day. - Horace (65-8BC), Pluck the Day, courtesy of www.poetseers.org. THIS story starts with wise words of one of the most celebrated Roman poets and will end about 2000 years ago later many thousand kilometres from Rome and in Queensland, Australia, where another seer has dropped (rather, dispensed with) the toga and stone slabs and is etching his own niche in poetry and history. What has poetry to do with the ‘marvellous community of classified advertising’, you may ask. Well, poetry is everywhere. Rhyme and rhythm are an ‘in-ya-face’ feature of modern life. Turn on the TV, radio or computer, or scan the pages of any newspaper or magazine and a poetic touch will tickle your heart. OVER the years, many such statements have leapt from the small print of the classifieds to give me a cardiac caress. Matters of the heart have been close to my ventricle for the past year since an unusual bump on an ECG print-out led to the diagnosis of a rare condition of a heart nerve, Brugada syndrome (www.brugada.org), and the implant of an internal cardiac device (ICD), a defibrillator, to protect against sudden fatal arrhythmia. But don’t celebrate too soon. The doctors say I now have better chances of surviving a heart event than the vast majority of the population and with above-average general heart health may live to 94 without the defibrillator ever delivering the life-saving shock. THE sentimentality of the festive season - as always, walking in the shadows of the smiles, jolly handshakes, hugs and kisses – may still partly explain my current poetic bent. The heart is long regarded as the seat of emotion, although some argue it is, in fact, the liver, which also takes a pounding each December-January. So you can see, quite a few influences are at work today, although the truth may be I just needed something to write about, maybe looking for rhythm (ha). But I just love that Horace poem, translated from Latin, in which www.en.wikipedia.org/ says the title was ‘Carpe diem’. Like most good poems it seems written ‘just for me’. Even the ‘pluck’ part. I am always plucking away at my guitar – again looking for that steady rhythm, I guess. BACK to poetry and the classifieds. Just have a browse through the pages of any edition of any newspaper and you’ll get to peep inside someone’s heart (or liver?). It’s worth the effort to see some inventive trading names in the business section but the personal columns can be a real hoot and you never really know when someone will drop a poetic word or two into their for-sale notice. Isn’t it just so great that a word or two, plucked from a sea of small type, can make a highlight of your day? Images: Poet Paul Dobbyn and illustrator Gemma O'Brien; Jen and Paul Dobbyn, Mirusia Louwerse and Sebastiaan Coenen. MY long-time mate Paul Dobbyn certainly has packed a lot of living into the past half century or so. He was a journalist with a young family when we met, in our twenties, while we worked in the regional press. Already, Paul held a university degree and had travelled widely in Australia, worked as a construction labourer and in other jobs before journalism and published his first book of poetry. During the 1980s, he wrote another book, upgraded his qualifications to become a high school teacher, then took another turn into sales in two of the most demanding fields (door-to-door and advertising), excelling in both. He has also worked in marketing and consulting in the job network and in marketing and publishing with major public agencies. THIS summary would be far from complete. It’s just what springs to mind, rather than Paul’s CV, but helps to illustrate forces that have shaped him as a poet. Out of all that life experience comes a special insight that reflects in Paul’s latest book, Soul Healing Afoot / Dead Dad Bye. Paul launched the work late last year (more below) and says he later "had the pleasure" of reading to high-flying star singer Mirusia Louwerse the book’s dedication. Mirusia and Paul have been friends since they were members of a "commuters club" chatting during their trips from the bayside to the CBD. Mirusia, my modern muse of the glorious voice who travelled with me by train each week those two years or so, reminding me, challenging me with that inner fire, true inspiration and dedication to artistry bring. THE reading occurred at "a bash at her parent’s place" after what Paul described as an "amazing story of success for young Birkdale lass as she flies again to top of charts aboard Andre Rieu's record-breaking DVD release from last month's Melbourne concert". "Unlike the ranting, raving, populist, (and frequently facile), performance poetry that seems to be springing up everywhere lately, Dobbyn's work is much slower in the fermentation, and deals with some of life's big questions. These are deeply felt, considered, highly-crafted poems about the challenges of middle age, about weathering divorce and rebuilding a life from its ashes, and about facing the death of an elderly parent - but they are not devoid of humour and, often, clever word play. Gemma O'Brien's lovely linocuts relate subtly to the poetry and, combined with the unusual font and off-white paper, the overall effect is of an 'artist's book'. 'Soul Healing Afoot' is the longer sequence, and deals with personal transformation: the poet drives into the desert while contemplating his unknown future; an encounter with a snake's shed skin prompts the lines: '... I knew how he felt, / that snake: / shiny and fresh - slicing through the grass: / chuckling at life's best trick - and gift - of all' . The collection is in two books which are bound together in a flip book style one part Dead Dad Bye and the other Soul Healing Afoot.There was a fairly large audience for the reading, standing room only, and we had some great live music in between readings ... I think all of us were so privileged to hear Paul's work and the poetry was amazing. One could not help but be moved by some of the pieces and laugh at others which had some very clever word plays.I am not Paul's publicist nor his marketing director but I can say that the poems we heard yesterday were outstandingly good and I would recommend his book, which is great value at only $20. I for one, am looking forward to my chance to enjoy a closer reading of the material over the holiday break. ANYONE wanting a copy of Dead Dad Bye / Soul Healing Afoot can email me through this site (see right of page). Paul has sent a link list: Compulsive Reader, myspace, fortheloveoftype, city-south-news. © 2006-2015 John Rumney, Russell Island, Queensland, Australia. Simple theme. Powered by Blogger.